Irish High Crosses - with the figure sculptures explained. Author, Peter Harbison and published by the Boyle Valley Honey Company. This attractive and informative little book written by Peter Harbison and illustrated by Hilary Gilmore was presented to me by the author at an exhibition of six of our great High Crosses which were on display at the Collins Museum about three years ago. The book was published by the Boyne Valley Honey Company first in 1994 and mine was a second edition published in 2001 with an introduction by Lord Killanin. 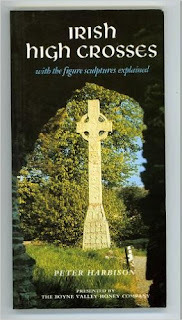 It is a short book of 110 pages but deals with the 75 Irish High Crosses scattered throughout the four corners of Ireland with their sculptured features presented and explained in considerable detail. There are about the same number of non-decorated stones of historical or ancient significance but which lack the details of the stones I am dealing with in this essay. They number too about 75 and are scattered equally around the country. These are listed but are not dealt in detail within this essay. Most of the sculptured stones have been provided with photographs or designs. Some display considerable detail despite their age and their exposure to the elements during the centuries. Added to the crosses there is a wealth of detail, some reminding us of biblical and religious artefacts. We have details about the location of these stones and their condition over their many years of existence. The stones were almost entirely placed in monasteries or graveyards and are reminders of the Christian faith and the bible which were such a feature of Ireland and Gaelic culture during the middle ages. All were constructed between the 7th and the 12th centuries. There are some historical details in the book about their years of construction and even about a few of the artists and workers involved. "High crosses are among the most important monuments to survive from Ireland’s golden age of Saints and Scholars, and the sculptured ones are described in detail here. Their figure carvings illustrate the Bible story like a filmstrip and this guide explains what the individual panels represent. Many novel identifications offered by the author shed new light on the deeper religious meanings of the crosses which can vary according to the choice of Biblical subjects. The book is designed as a field guide for those who want to study the crosses at first hand. 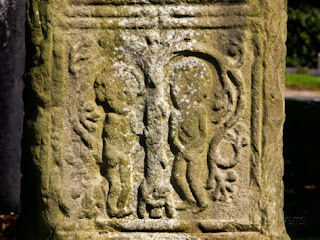 Black and white diagrams assist in pinpointing the various Old and New Testament scenes sculpted on them"
These memorials are cared for by the Board of Works, by the local authorities and by the local people who have the stones on their property. Some are now protected indoors in chapels or museums and are replaced by concrete replicas on the site. As regards the survival of these treasures, it is fortunate that many of the crosses are lying in less visited parts of the country and in old, remote graveyards or long since deserted churches. 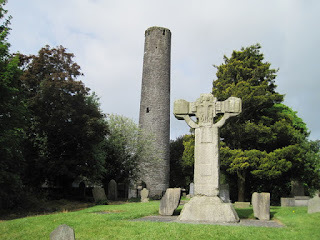 They were erected when Ireland spawned its great reputation of Christianity. In this guide they are arranged in alphabetical order of their titles and sites, and the National Grid reference will help the reader to locate them at the end of the booklet. Ireland can boast an early and rich history of fifteen centuries which must be unique in Europe in terms of a settled language, tradition and culture. Many of these stones have survived in the countryside without obvious damage but naturally there are many pieces affected by the passage of time, the attention of the local and travelling people, the inevitable ageing of the material such as sandstone used by some of the artists and the national attention in the past century or two to attend to their preservation. Whilst many of the relics are found in the more remote areas of our countryside, others are well known and are more easily accessed by the visitor. 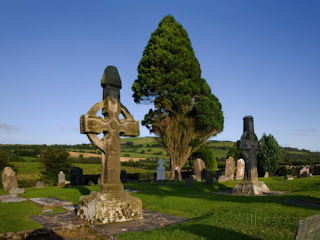 Recently we visited the two crosses at Ahenny in the southeastern part of Co Tipperary. It took us quite some time to find them and then only with the assistance of some of the local people. The two crosses remain undisturbed and a natural feature of the old cemetery, made all the more so by the finding of recent as well as long standing burials. 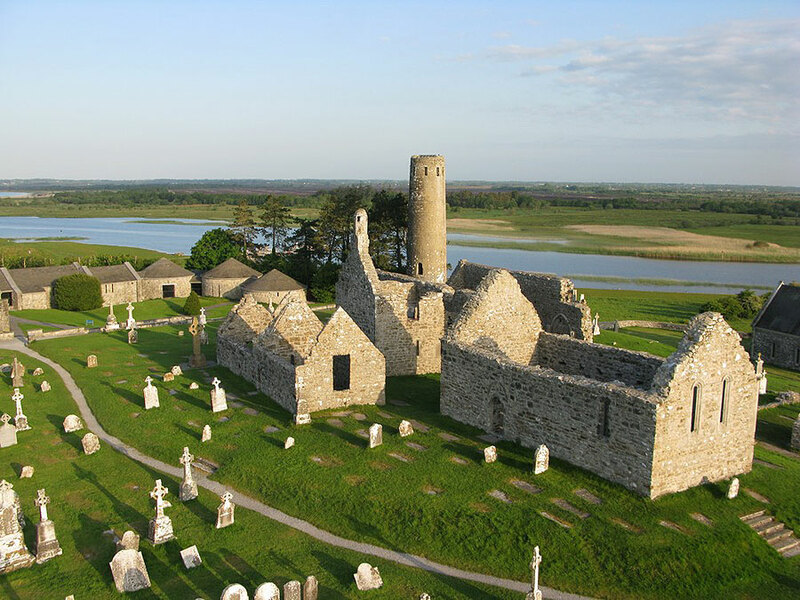 On the banks of the Shannon in Co. Offaly in the centre of Ireland, the details of the artefacts at Clonmacnoise are described in eight pages. The crosses have now been moved for safety to an indoor location on the site. The site on the Shannon is physically in the centre of Ireland and was founded in the year 545 by St. Ciaran. It has a history of about 15 hundred years since its foundation. According to local history the monastery “chose its abbots for their qualities rather for their family connections”. It has amongst other relics a round tower erected about the 11th or 12th century and evidence of six churches providing a site of great pilgrimage for centuries. Other artefacts are also on display in the new interpretive centre. 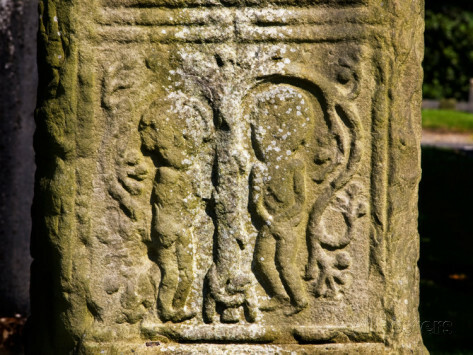 There are many details of the three great crosses on the site and much information is provided which subsequently is mentioned by the Annals of the Four Masters when they were alluding to the affairs of the monastery during the 10th and 11th centuries. The largest of the five crosses is called The Cross of the Scriptures and is described in detail with the sculpture base having the four different faces North, South, East and West. The details retained on the cross at Kills in Co Meath are still quite extraordinary where again the four sides of the cross are described in great detail and are still in a remarkable degree of preservation. They are certainly worthy of a visit, particularly if one is equipped with the information at hand in this or other equally informed documents. 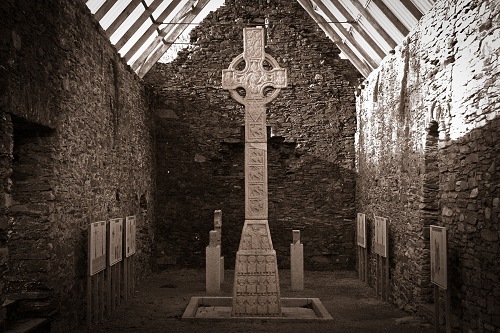 The designs of the crosses and the other structures, and the closeness of Killary and Slane, with their own artefacts, are within 30 miles of Dublin, as are Monasterboice, Glendelough, Templemore and other sites. They can be easily reached from the city. Indeed, with our recently acquired motorways built from Dublin in all directions of the island, a week’s holiday spent visiting our monastic sites included in this book could be provided with a wealth of biblical and historical detail and with the deep sense of knowledge provided by the author. Some of the other more distant sites are of equal interest. Cashel, about 100 miles from Dublin, is worth a visit for it’s ancient church, cross and great tower. On the way home, one can visit Castledermot for its cross and its other ancient artefacts. Within the four corners of Ireland there are more than enough sites worth a visit by the stranger which will provide a fine opportunity to see some of the more remarkable reminders of our ancient past and of our ancient culture and between visits there is always an opportunity in finding a pub or hostelry where one might enjoy some of the other pleasures of a visit to Ireland. 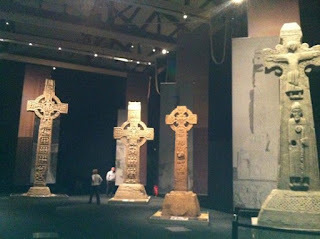 What is striking about the Irish high crosses is that they are Coptic crosses, not Roman ones. I am fascinated by the links between Irish cultural forms like traditional stitching patterns and sean nós singing and the culture of the Maghreb of Africa. Under all pious legends there can lurk a darker story, and the suppression of a Coptic Christian tradition in Ireland by subsequent Roman Catholic missionaries seems likely to underlie the Saint Patrick story. 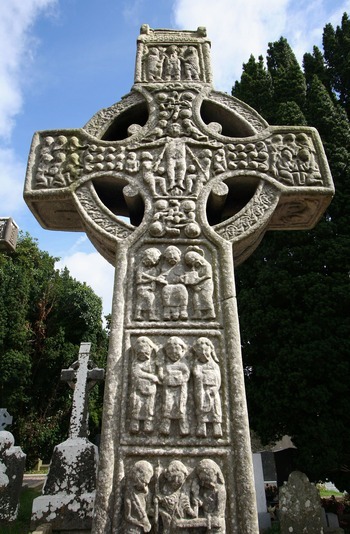 It does not seem possible that Ireland had no contact at all with Christianity until 432 AD.